Why Choose ICF to build my house? The building materials you choose for your next project will impact the value of your custom home for its lifetime. By using Insulated Concrete Forms to build your next home you can ensure you are choosing the best building solution. ICF construction provides substantial benefits over traditional stick framing methods by providing shorter construction time, energy efficiency, higher sound resistance, up to 4 hour fire protection, higher wind resistance, healthier indoor air quality and long lasting value. When you build with TMC & NUDURA Insulated Concrete Forms you can be sure that you will have a structure that is safe and comfortable, yet built at a competitive price with minimal long-term maintenance and service costs. From NUDURA Floor Technology, Ceiling Technology and our wall forms, NUDURA maximizes your home's comfort, durability, cost and energy efficiency. Simplifying the challenges of today's construction and architectural demands while meeting the demands of the Environment. Not only are TMC ICF custom homes stronger, safer healthier and more energy efficient they are also friendly to the environment. TMC offers more than a product to construct walls with. We offer an innovation solution to seeking more than just a home. 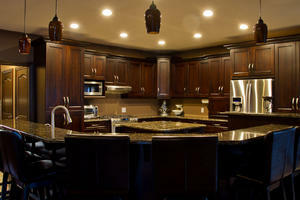 Leading the way in environmental custom built home design, TMC offers you a cutting edge solution for your next home. By Using NUDURA Integrated Building Technology products you will have an energy efficient building envelope providing mold resistance unlike traditional stick framing methods. By eliminating gaps in walls where moisture can collect TMC & NUDURA eliminate dangerous mold and mildew growth that so often happens with a traditional stick frame home. NUDURA is also proud to contribute to the LEED program, contributing to more areas than any other building product. Here's a summary of the utility cost differences between our last home and our TMC built current home.